Huh? 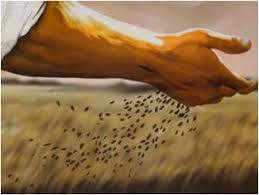 Does Jesus really mean to say that the purpose behind parables is to confuse the outsiders? Yes, according to virtually all interpretations of this passage. Taken out-of-context, this still seems disturbing — disturbing, that is, until you realize Jesus is quoting from Isaiah 6:9-10. In fact, the use of the parable2)The Hebrew word for parable is mashal (מְשַׁל) and is more correctly understood as a simile. Here is the definition of mashal from the Theological Wordbook of the Old Testament: “Proverb, parable, allegory, byword, taunt, discourse. Of great interest is the wide number of translations for this word in most English translations of the Old Testament. The substantive appears thirty-nine times (eight times in Ezk).” is widely attested in the Hebrew Bible (aka Old Testament) and was used by the biblical authors to simplify complex ideas. So, with this in mind, let’s see how Isaiah 6:9-10 is used by Jesus “so that the Scriptures might be fulfilled“. In Isaiah 6:9, God instructs Isaiah what to say and, for completeness I show my translation of the text from Hebrew to more conventional English. Literal And-He-said go and-say to-them, these-people, you-hear to-hear yet-not-do-you-understand and-you-see to-see but-not-do-you-know. In this verse, God is evidently frustrated that His people hear His words and see His actions, but just do not conform to His will. Thus, in verse 10, God instructs Isaiah to bypass their eyes and ears — to render them metaphorically deaf and blind — and speak directly to their deeper intellect. In other words, not to speak plainly but in parables (mashalim). Dynamic Fill the heart4)In biblical Hebrew, the heart is viewed as, among other things, the source of intellect, reason, and wisdom, not emotion or motive. Emotion and motive are more often associated with the groin or abdomen. of my people, but cause their ears to be deaf and their eyes to be blind. Otherwise, they will fail to understand. If you do this, they will understand in their mind and return and be saved. By using parabolic, figurative speech they’ll be forced to disconnect from the literal words and engage the inherent symbolism of the mashal. With this in mind, we can understand now why Jesus quotes Isaiah as the reason He uses parables. Straightforward speech was evidently as ineffective in Jesus’s day as it was in Isaiah’s time. Thus, does Jesus use parables to accomplish what Isaiah could not. It is as if Jesus was recapitulating God’s command to Isaiah. And when he was alone, they that were about him with the twelve asked of him the parable. And He said unto them, “Unto you it is given to know the mystery of the Kingdom of God: but unto them that are without, all these things are done in parables. In other words, For the purpose of their calling as future teachers of Torah, they will be taught the underlying meanings of the parables of Jesus. However, because most of their own disciples will not understand the complexities inherent in theological explanations, Jesus commands his apprentices to teach using mashalim. 3. ↑ In biblical Hebrew the placing of a verb and its infinitive next to one another is a means by which the biblical author shows emphasis. In such cases the infinitive is often translated as ‘surely’ or ‘certainly’ — as I did in this case. 4. ↑ In biblical Hebrew, the heart is viewed as, among other things, the source of intellect, reason, and wisdom, not emotion or motive. Emotion and motive are more often associated with the groin or abdomen. 2 Responses to Why Parables? I love this explanation! Jesus masterfully taught moral principles by using simple, down-to-earth illustrations about everyday objects familiar to those around Him. And at the same time, His parables seemed obscure to some. Some say that Jesus concealed truth from those who would reject His message–a judgment on their own hardheartedness. Others believe that Jesus may have recognized that His teachings could cause casual observers, opponents and overzealous supporters to steer His ministry toward a premature conclusion. And perhaps He obscured some teaching to prevent that from happening. To people willing to receive Jesus’ message, His parables can and will communicate further truth about the nature of God’s kingdom. So how can we apply this to ourselves? Are you and am I willing to act upon timeless truths from God’s word that we already understand? When we listen to God’s word do we listen with ears only? Are you and am I willing to listen with our hearts and minds? How willing are you and I to dig deeper in order to find profound spiritual insight for application? Could it be that we sometimes do not understand because we are not ready to understand? And if we are not yet ready to understand even though willing, do you believe He will enable you to do so at some later time?